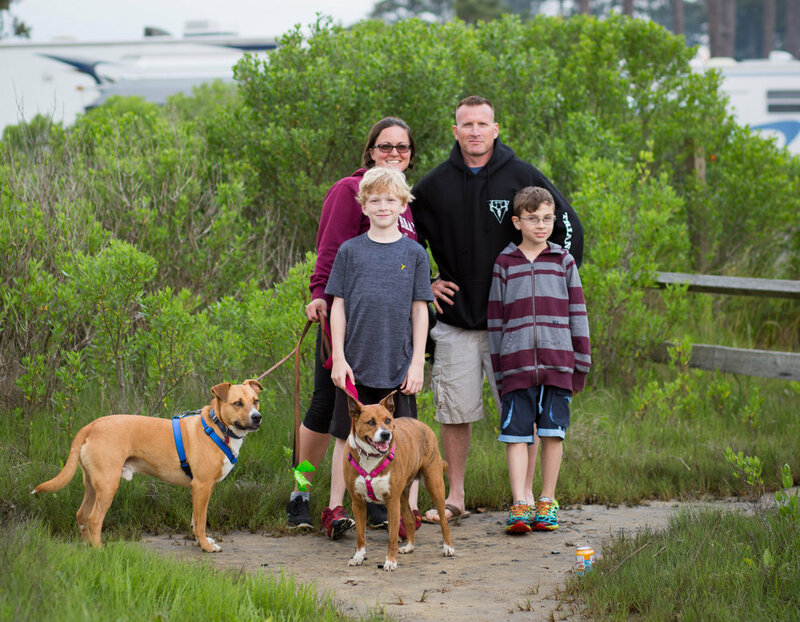 My husband and I recently got interviewed about camping and some of the questions we were asked were, “What makes you different than other campers? Why would people be interested in your camping story?” We looked at each other, thought about it for a few seconds and my first response was “we love camping and we camp a lot.” Our interviewer responded by telling us, “everyone who camps says they love camping, but why are you different and how can people relate to your style of camping.” To that we blabbered on and on about time with our family, making plans, seeing new things, having new experiences and all the other things that relate to camping. In general when we talk about camping we talk about the positive things. We don’t talk about the trials of backing up a RV, driving down I-95 in a rain storm in heavy traffic with our camper door flapping wildly, accidents at the dump stations, arguments over what is on the radio, a kid who can’t properly pee into a bottle in the back seat and accidently pees all over the truck and himself, dogs that run away at a campground because they are terrified of thunder and fireworks, or even getting lost. No all the negative stuff becomes things we laugh over. Of course not at first but they are mistakes we have and do learn from and eventually laugh about. I really don’t know what makes us different than other campers. It is the same as asking what is different about your family from other families. I can’t imagine there are any two families that are the same. Here is a little bit about us. We currently camp in a Jayco Eagle HT 30.5MBOK fifth wheel. We pull our 10,000 pound 37 foot fifth wheel with a 2500 Ram Mega Cab 4.10 rear axle truck. That my friends is a lot of RV and a lot of truck. It all comfortably fits my husband, our two sons (ages 10 and 9), our two dogs and myself. I grew up camping as a kid with my parents in an RV. My husband grew up visiting relatives and cousins at a seasonal campsite. Before kids my husband and I went tent camping. But quickly after we got married we started popping out some kids and settling down in our new home. Once the kids were walking, talking and pretty much out of diapers I started getting the itch to go camping. We became friends with our new neighbors who had a travel trailer. The more we hung out with them the more we talked about camping. We decided to take a camping trip together, but since we didn’t have an RV at the time we rented a park model at the campground and they brought their travel trailer. After that first trip together as a family we couldn’t wait to go again. We purchased a truck and I was researching travel trailers. 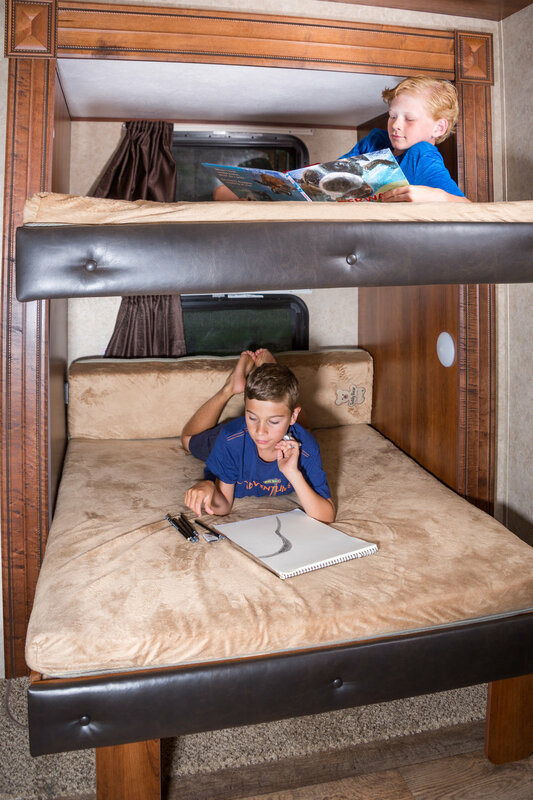 I remember dragging my two young sons and husband all over the Hershey RV Show (it is one of the biggest RV shows in the country). I had brought candy corn with me and if the boys behaved as we inspected a travel trailer I would give them one piece when we got out of it. Needless to say at the end of the day they were on sugar highs and bouncing off the walls. We didn’t purchase anything there, but we did get a great idea of the floor plan we wanted. The whole show we stuck to looking at travel trailers we could tow with our truck, which at the time was a 1500 Ram. For some reason at the very end we walked into a fifth wheel. My jaw dropped to the floor and at that moment I declared I don’t know what it will take and how on Earth it can happen, but someday I’ll have a fifth wheel. We came home from the RV show with a much narrower search for a travel trailer. We had ruled out all the things we didn’t like and started focusing on used travel trailers that had most of the features we did like. My husband was still unsure about pulling a 30 travel trailer, but his concerns were quickly diminished when our neighbor handed him the keys to his truck with his travel trailer hooked up and told him to take it for a spin. Together they drove around on highways and local roads and practiced parking it and turning it in a large parking lot. After that experience my husband declared “it wasn’t as terrifying as I thought it was going to be.” Shortly after that we found a used travel trailer and we have been camping with our neighbors ever since. We had a specific budget with our first travel trailer and we felt like if this camping thing doesn’t work out for us we can sell it and not have that much of a loss. Before we knew it we were spending as much time as we could camping. People started asking us why we liked camping. My husband said it best, “when I get to my camp site I have a feeling come over me that says yes this is me.” Maybe for you it is sitting at a slot machine at a casino, or maybe at the salon, or maybe curled up in your pjs with a bottle of wine. But you know that feeling deep down inside where you just take a big cleansing breath and feel at peace. Okay in honest that cleansing breath might come after a few shots of Fire Ball Whiskey and the camper is all plugged in and our site is set up. But that feeling comes and it doesn’t go away until the site is packed up and we are heading for home. Bike riding at Moose Hillock in NY. Our move to the fifth wheel came after my husband declared we don’t have enough elbow room in our travel trailer. We started looking at fifth wheels because of the overwhelming recommendations from other RV owners. They all claimed how much nicer it is to tow a fifth wheel and I hadn’t gotten over the feeling I had when I first stepped into one at the Hershey RV show. So we started looking at fifth wheels. We upgraded our truck from a 1500 to a 2500 Ram Mega Cab. Even though we saw a lot of beautiful fifth wheels we didn’t find one with a floor plan that was much better than the one we had in our travel trailer. The biggest drawback of our travel trailer was the side out wasn’t very deep. After a ton of research we found a new floor plan for a fifth wheel that fit the size, price and weight we were looking for. We customized and ordered it and before we knew it we were fifth wheel owners. A dream come true way earlier than I ever would have thought it would. The bunk room in the fifth wheel. 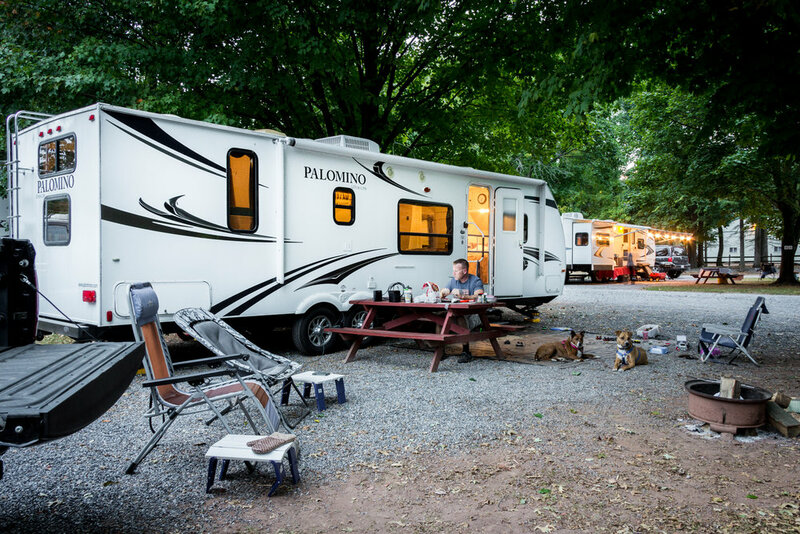 There are quite a few things that made us decided on the fifth wheel to fit our camping lifestyles. First off our kids are 10 and 9 years old. I like to think we have a lot of good years of camping ahead of us before they head out on their own and don’t travel with us. The fifth wheel has a residential feel and I must say it is even nicer than my house. We tend to camp for at least a week at a time so we wanted something we would be comfortable in. We camp in all types of weather from 100 degree days to freezing. We don’t cancel a trip because of the weather or if we are sick. If the weather is bad we are more than comfortable being in our home on wheels and if one of us is sick we at least have a change of scenery out our window. 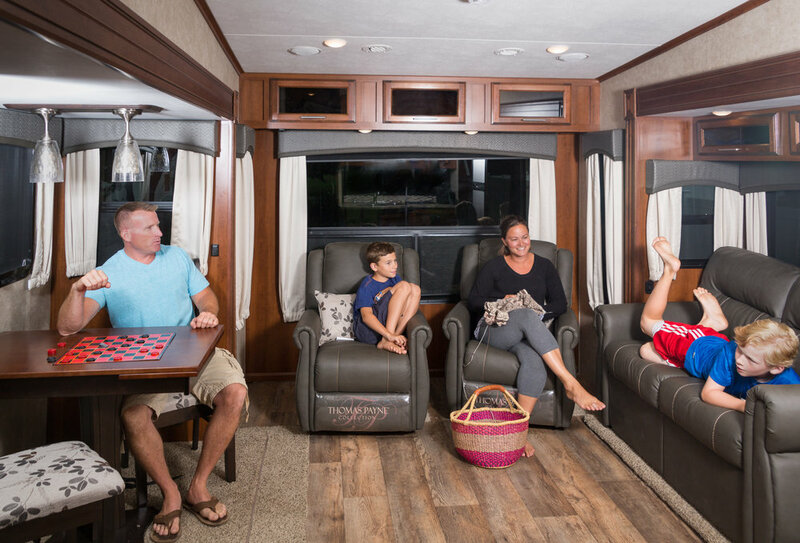 Another thought we had when we decided on the floor plan of our fifth wheel was if we were to get a seasonal campsite we wanted a unit that would be comfortable to stay in for extended periods of time and we could fit guests as well. 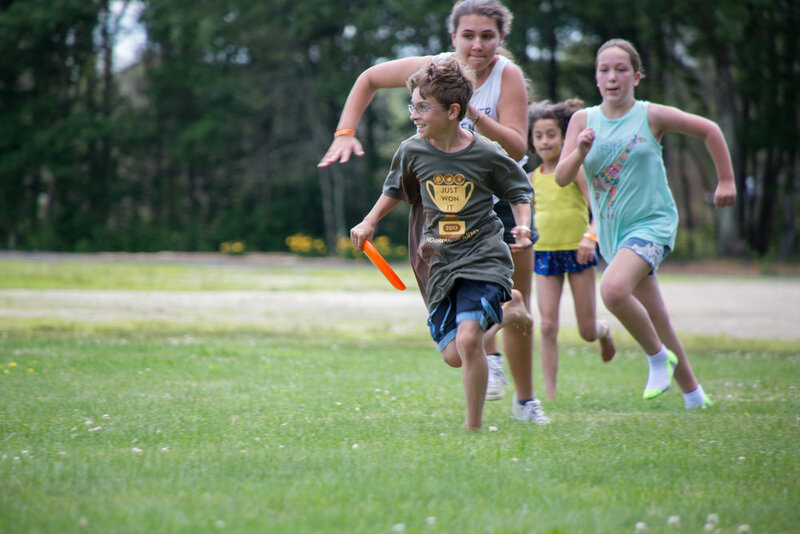 Playing capture the flag at Normandy Farms Campground in Foxborough, Mass. We are the types of campers that like to treat our summers as if we are in Summer Camp with our kids. We love to play, explore, hike, bike ride, make friends and spend time together having new experiences. We love going to new places and learning new things. We also love going to back to places we have already been and loved. We love having a place to call home that goes everywhere we go. We love the dedicated time we make for our family by going on camping trips. We love the freedom of camping of being able to leave when we want to, stop when we want to and go where we want to. Our family has each taken on different responsibilities. I am the planner. I book the trips and plan our routes as well as activities. My husband is the driver and gets our 5er where it needs to be. The kids help with the setup of the site and the occasional cooking over the campfire. The dogs are my alarm clocks. They are wildly excited to get up at 5 am on a camping trip to go for a walk, even though at home they don’t get up until much later. But I only complain for a few minutes, because they get me up early and I hardly ever miss a sunrise. As the kids ages change so does our style of camping. We all enjoy going to a resort style campground with nice pools and organized activities. We also enjoy going to campgrounds that serve as a base camp while we go out and explore every day. It is always nice to have a safe and cozy place to come back to after a long day of exploring. We do push ourselves outside of our comfort zones and try things like difficult hikes, white water rafting, and zip lining. 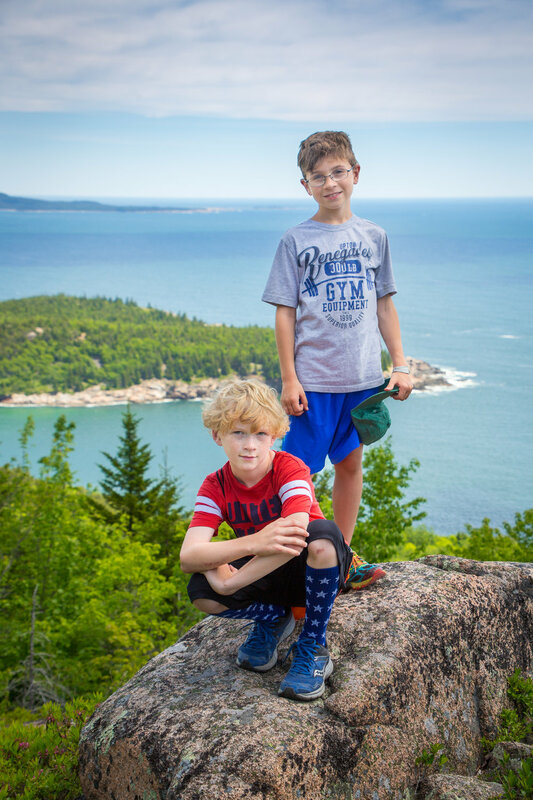 If it was up to me we’d go horseback riding and kayaking on all of our trips, but until my kids don’t think those are terrible activities we are limiting those. White Water rafting with our neighbors on the Sacandaga River in NY. When I was pregnant and reading books about parenting there was an article I found very interesting. It was about deciding if you should be a stay at home mom or if you should be a working mom. It covered the sacrifices each one had. One thing from the article that really stuck with me was it said “working mothers tend to spend more quality time with their children. Since they are away from the home working they feel guiltily and make up that time with dedicated quality time with their children.” It talked about how stay at home moms had to juggle so much of the daily work that by the end of the day they are exhausted and if they look back at their day they might see they spent the entire day with their children, but did they make it quality time? I am a stay at home working mom so I have no idea how I fit into that equation, but what I got out of that article was to make sure I spend quality time with my children every day. Myrtle Beach Travel Park, SC. I have found camping gives us that quality time every family needs. We all take a break from our jobs and the only thing we have to focus on is each other. Whether we are camping in a tent, pop up, travel trailer, motor home or fifth wheel it doesn’t matter. It is the dedicated time we make to be with each other. On every trip we learn more about each other and we come back home as a stronger more connected family. So what makes us different than other campers? Not only do we love to camp we love to talk to other campers and tell them our stories of places we have been. We love to help them by sharing the things we have learned on our camping journey to help them with theirs. We are constantly educating ourselves on vehicle maintenance, towing safety, camping equipment, campgrounds and RV groups. We love to be included in RV owners’ discussions and we love answering questions people have about becoming RVers. We might spend way too much time on social media sites talking about real axle ratios and pay loads, but if it helps another family get on the road and start camping we are so happy we were able to help. Shelving Rock Falls Lake George, NY. Our fifth wheel on our campsite at Moose Hillock in NY. Why would people be interested in our camping story? Because we are awesome! Okay maybe only we think that. But we do like to think we inspire other people to camp. We inspire them to find time to get away from their everyday lives and make time for themselves and their families. It can be much more affordable to go camping for 50 nights than going on a week vacation to a resort. Camping allows us to go away more often then we could if we were to travel by airplane and staying in hotels. Also I should point out we put our money into our 5er, truck and campsites then we do into improvements in our home. But hey it is what works best for our family. We go to a lot of places and we have a lot to share about each place we go to. We hope to inspire more people to pack up and head out on an adventure, or many adventures for that matter. You only get one chance at this parenting thing hopefully we are doing it right.